C-FOVN of Gateway Aviation at Yellowknife - CYZF, NT. N9707B prototype Vazar Otter at Vancouver - CYVR, British Columbia. C-GCMY at Vancouver - CYVR, British Columbia. • 3668 Delivered to the Royal Canadian Air Force on 15-Dec-1953. After delivery it was allocated to the Central Experimental & Proving Establishment (CEPE) Climatic Detachment that month, based at Namao Air Base, Edmonton, AB. Note: Placed in storage at the Lincoln Park, AB., depot as a reserve aircraft, where it remained from Oct-1957 until Mar-1964 when the depot closed after which it was roaded to Saskatoon, SK., and stored pending disposal. • CF-OVN Gateway Aviation Ltd., Edmonton, AB. Regd 16-Dec-1969. Based Yellowknife, NT. • C-FOVN Re regd 10-Apr-1972. • C-FOVN Title transferred to Federal Business Development Bank following bankruptcy of Turn Air. Note: Advertised for sale by Mike Hackman Aircraft Sales, Edmonton, AB. Total time: 10,800 hrs at Nov-1985. • C-FOVN Aero Aviation Centre (1981) Ltd., Edmonton., AB. Regd 19-Aug-1986. • N9707B North American Gold Center Inc., Las Vegas, NV. • C-GCMY Central Mountain Air Ltd., Smithers, BC Regd 12th May 1989. Canx 26-Sep-1992. • C-GCMY Also reported as Wolverine Air (1988) Ltd., Fort Simpson, NT. Regd in June 1992. • C-GCMY Leslie Dvorak, Fort Simpson, NT Regd 10-Dec-1992. Canx 19-May-1993. Note: Poss ibly also Air Tindi, Whitehorse, NT during 1993. • C-GCMY Harbour Air, Richmond, Vancouver, BC. Based Prince Rupert, BC. Regd 19-Mar-1993. Canx 19-May-1993. & 19-Sep-1996. Accident: Eighteen miles south of Alliford Bay, Queen Charlotte Islands, BC. 18-Aug-1996. The pilot of the float-equipped turbo Otter departed Alliford Bay, six nautical miles south-west of Sandspit, on a chartered 26 mile flight south to Tasu, BC. The pilot picked up two passengers at Tasu and departed on the return flight to Alliford Bay. A search was initiated when the aircraft failed to arrive at its destination. The Otter was located the following day in steep terrain at 1,700 feet ASL eighteen miles south of Alliford Bay. Buffalo aircraft and Labrador helicopters of the Canadian Armed Forces' 442 Squadron from CFB Comox were heavily involved on the search.The evidence indicated that the pilot encountered low ceilings and visibility in moderate rain. He had flown up a valley which ends with the terrain rising steeply to 3,350 feet ASL. This valley is deceptively similar to another valley which forms an established VFR route and which, if followed, would have allowed the pilot to stay at a low altitude and below the cloud. The pilot's planned route was to leave Tasu heading toward the north end of Newcombe Inlet, cross some low terrain for two miles and then turn eastwards through a valley to Sewell Inlet en route to Alliford Bay. Just north of the turn-off to Sewell Inlet there is a valley leading northward into a box canyon where the terrain rises abruptly to 3,350 feet. The two valleys are similar in appearance and both have a creek and road following the valley floor. The Otter flew past the valley leading to Sewell Inlet and continued north into the valley leading to the box canyon and subsequently struck the side of the valley at 1,700 feet. The aircraft struck terrain in controlled flight in a climb configuration with the wings level. It was substantially damaged and the pilot and two passengers were killed”. In fact, the aircraft was completely wrecked, and the only part which was salvageable was the rear fuselage, which was later noted at the Viking Air facility at Victoria, BC, acquired for its frames and stringers. Otter number 22 was delivered to the RCAF on 15 December 1953 with serial 3668. It was allocated to the Central Experimental & Proving Establishment (CEPE) Climatic Detachment that month, based at Namao Air Base, Edmonton, Alberta. The Detachment specialised in cold weather testing. It was in an all-silver scheme with a polar bear crest under the cockpit door, code PX (roundel) 668 on the fuselage side and the full serial on the tail. The Otter remained at Namao supporting the work of the Detachment until July 1956 when it transferred to the CEPE main base at Rockcliffe, Ontario but only for a brief period. Its next posting was to 403 Squadron, Calgary, Alberta. This was an Air Defence Command squadron flying the Mustang and T-33 which in July 1956 was notified of a change of role to light transport and re-designation as an auxiliary squadron, becoming 403 “City of Calgary” Squadron, with Beech Expeditors as its initial equipment. On 1st November 1956 Otter 3668 arrived at Calgary, the first of four Otters for the unit. It had been flown in from Rockcliffe by a ferry crew from 129 Acceptance & Ferry Flight. Its period of duty with 403 Squadron was relatively brief as in June 1957 it was re- assigned to 121 Communications & Rescue Flight based at Sea Island, Vancouver, BC. Its operation by 121 Communications & Rescue Flight only lasted five months. It is mentioned once in the Unit’s diary, on 2 August ’57 routing from Carmanah Point on the west coast of Vancouver Island to Duncan, escorting 121 C&R’s H-21A helicopter 9611. In October 1957 it was put into storage at the Lincoln Park, Alberta depot as a reserve aircraft, its total time in military service having been 1,116 hours. The depot was located at what was then the downtown Calgary Airport, from where the Otter had previously flown with 403 Squadron. The depot was run by Canadian Pacific Airlines, into whose care the Otter was entrusted. It remained in storage there for six and a half years, until March 1964, when the Lincoln Park depot was closed and it was roaded to Saskatoon and stored there pending disposal. The Otter was sold in May 1965 to Western Aero Renters Ltd of Edmonton, Alberta to whom it was registered as CF-OVN on 16 July 1965 and it was leased to Gateway Aviation Ltd of Edmonton. It was painted into the Gateway colour scheme of white top, red cheatline, grey underside with the company logo on the tail. Gateway had a base at Yellowknife, from where the Otter flew, serving the Northwest Territories, supporting mining and exploration industries. Gateway bought the Otter in December 1969 from Western Aero Renters and it was registered to Gateway, the registration being changed to C-FOVN in April 1972. It alternated between being based at Edmonton and Yellowknife and by March 1979 its total airframe time had reached 8,429 hours. Gateway Aviation had operated a number of Otters over the years, of which OVN was the last to remain in service. In 1979 Gateway Aviation was taken over by Northward Airlines, at which stage its Yellowknife base and Otter C-FOVN were sold to Turn Air Ltd, to whom the Otter was registered on 11 June 1980. The Otter was painted into a new colour scheme, with a thick red cheatline along the window line and up the tail, blue under-fuselage and small Turn Air titles. It flew alongside Turn Air’s Beech 18 C-FWWV and some Cessna 185s. For the next five years OVN continued operate from Yellowknife on charter work in the Northwest Territories, on wheels or floats depending on the season, until Turn Air encountered financial difficulties. Turn Air had mortgaged the Otter to the Federal Business Development Bank, who took court proceedings to recover the money due. The case went to the Supreme Court, as a result of which title to the Otter and a Cessna 185 C-FYNM was transferred to the bank. The Otter was repossessed by the bank on 12 March 1985 and flown to Edmonton, Alberta. The Otter was advertised for sale in May ’85 by Mike Hackman Aircraft Sales of Edmonton, acting on behalf of the bank. It was advertised as having 10,800 hours on the airframe and as being a “bank repo”. By Bill of Sale 1 November 1985 the Otter was sold to Aero Aviation Centre (1981) Ltd., of Edmonton, Alberta, an overhaul and repair shop, to whom C-FOVN was registered on 15 November ’85. Aero Aviation Centre took the Otter into their hangar at Edmonton where considerable work was undertaken on the aircraft, including re-skinning the port outer wing and a section of the lower rear fuselage. The Otter was then sold on to North American Gold Center Inc., of Las Vegas, Nevada by Bill of Sale 18 August 1986, although the Otter was still parked at Edmonton during November ’86. It had been registered in September ’86 to its new owners as N9707B and was subsequently flown to Salinas, California. Quite what part the unusually named North American Gold Center inc played in the scheme of things is unknown, but the Otter’s registration to this company was as part of its conversion as the prototype Vazar turbine Otter. Around the same time as the Cox Turbo Otter (421) crashed, thus effectively ending that particular turbine conversion, Vazar Aerospace of Bellingham, Washington started work on a turbine Otter conversion utilizing the Pratt & Whitney Canada PT-6A engine. N9707B was selected as the prototype and the conversion work was undertaken by ServAero Engineering at Salinas, California during 1987. This particular conversion was a much simpler and more effective one than the Cox conversion and was to prove a winner. Rigorous flight testing was conducted throughout 1988 and in August of that year N9707B flew from Bellingham to Ketchikan and Wrangell in Alaska for demonstration to local operators. US certification was achieved in November 1988 after which Vazar Aerospace proceeded to market the “Dash 3 Turbine Otter”, with considerable success. The Otter remained in basic Turn Air colour scheme but had “Dash 3” on the tail, and flew on amphibious floats during 1988 and 1989. N9707B continued flight testing for Canadian certification, in the course of which one incident was recorded. On 11 January 1989 at Beach Corner, Alberta while conducting a test flight, the aircraft’s control column began oscillating fore and aft and the pilot made a precautionary landing. Test flying continued for a few more months, Canadian certification for the Vazar Dash 3 being granted in June 1989. 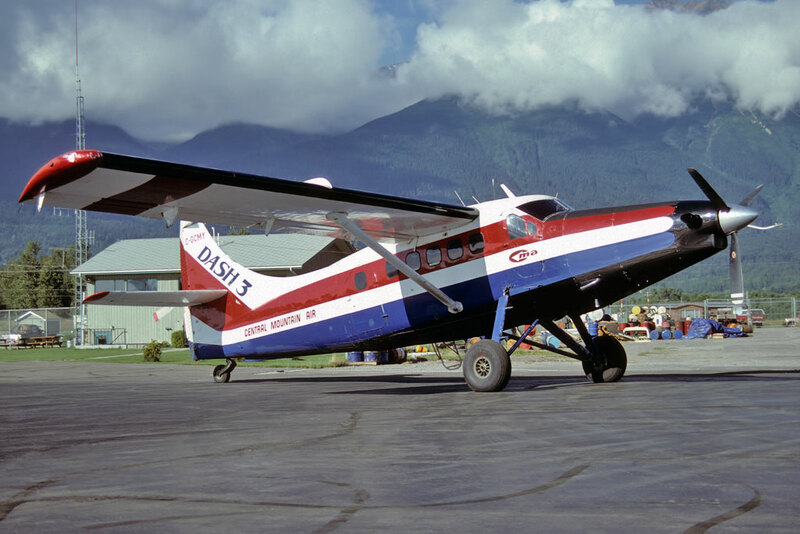 In the meantime, its test work complete, Otter number 22 was sold back to Canada, being acquired by Central Mountain Air Ltd., of Smithers, BC. It was allocated marks C-GCMY on 3 May ’89 and ferried that day from Vancouver to Smithers, being formally registered to its new owners on 12 May ’89. It was used to fly for the mining and exploration industries, setting up and servicing camps, and also for hunters and fishermen. 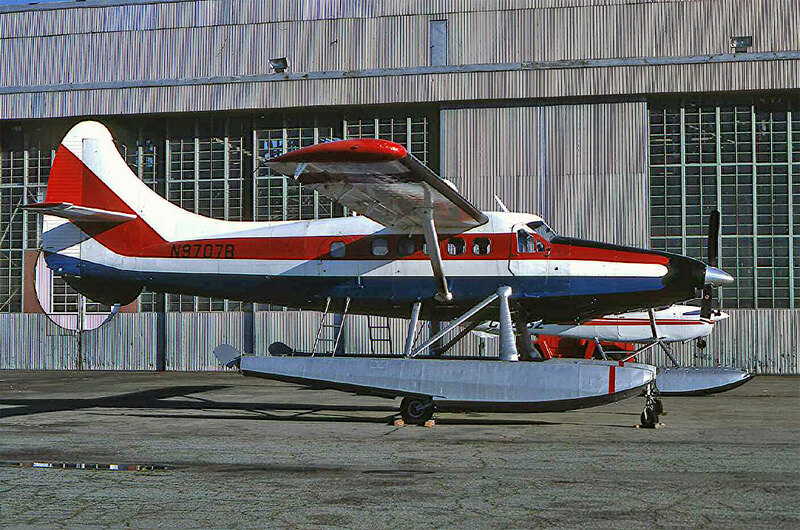 It flew on wheels, floats or amphibious floats depending on the season and was one of four Otters operated by Central Mountain Air. Originally it was operated in the “Dash 3” colour scheme of its former operator, with Central Mountain Air titles and was still in that scheme in September 1990 but was then repainted all white, with a red cheatline and Central Mountain Air logo on the tail. In June 1992 CMY went on lease to Wolverine Air (1988) Ltd., of Fort Simpson, NorthwestTerritories. 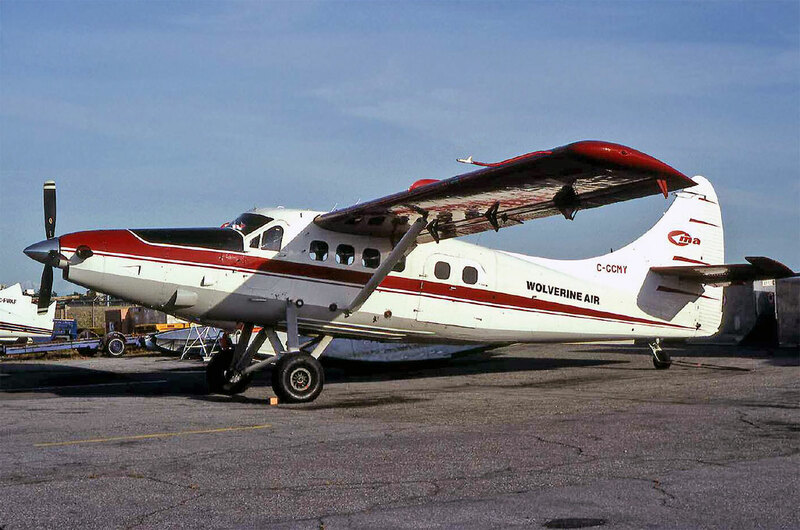 Central Mountain Air titles were removed from the aircraft at Vancouver on 20 June ’92 and Wolverine Air titles had been put on by 25 June after which it departed Vancouver for Fort Simpson. 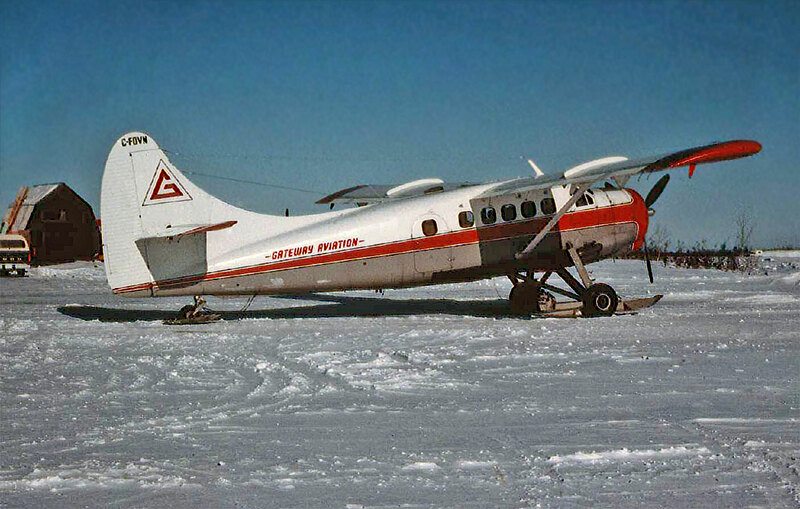 On 10 December 1992 the Otter was registered to Leslie Dvorak of Fort Simpson and went on lease to Air Tindi, based at Yellowknife. This continued until it was sold in March 1993 to Harbour Air, to whom it was registered, still as C-GCMY, on 6 April 1993. It was noted in the Harbour Air hangar at the Vancouver International Airport in October 1994, completely stripped to bare metal in readiness for a respray into the Harbour Air yellow and white colour scheme. It then flew out of Harbour Air’s seaplane base at Seal Cove, Prince Rupert on amphibious floats. The Otter is mentioned in an incident report on 10 April 1995. It was en route from Seal Cove to Port Simpson when it encountered rain, strong winds and turbulence. A piece of plywood sheeting, which had not been securely tied down, moved and struck a passenger’s seat back. After landing the passenger went to a local clinic as a precaution. The report noted that “the company has instructed its cargo handlers to be more diligent in securing awkward shaped loads”. By 20 December 1995 total airframe time had reached 15,608 hours. C-GCMY, operated by Harbour Air, met its end on 18 August 1996 eighteen miles south of Alliford Bay, Queen Charlotte Islands, off the northern BC coast. As the accident report summary states: “The pilot of the float-equipped turbo Otter departed Alliford Bay (six miles southwest Sandspit) on a chartered 26 mile flight south to Tasu. The pilot picked up two passengers at Tasu and departed on the return flight to Alliford Bay. A search was initiated when the aircraft failed to arrive at destination. The Otter was located the following day in steep terrain at 1,700 feet ASL, 18 miles south of Alliford Bay”. Buffalo aircraft and Labrador helicopters of the CAF’s 442 Rescue Squadron, Comox were heavily tasked on the search. “The evidence indicates that the pilot encountered low ceilings and visibility in moderate rain. He had flown up a valley which ends with the terrain rising steeply to 3,350 feet ASL. This valley is deceptively similar to another valley which forms an established VFR route and which, if followed, would have allowed the pilot to stay at a low altitude and below the cloud.” The pilot’s planned route was to leave Tasu heading toward the north end of Newcombe Inlet, cross some low terrain for two miles, and then turn eastwards through a valley to Sewell Inlet en route to Alliford Bay. Just north of the turn-off to Sewell Inlet there is another valley leading northward into a box canyon, where the terrain rises abruptly to 3,350 feet. The two valleys are similar in appearance and both have a creek and road following the valley floor. The Otter flew past the valley leading to Sewell Inlet, continued north into the valley leading to the box canyon and subsequently struck the side of the valley at the 1,700 level. “The aircraft struck terrain in controlled flight in a climb configuration with the wings level. It was substantially damaged and the pilot and two passengers killed”. In fact, the only part of the aircraft which was salvageable was the rear fuselage, which was later noted at the Viking Air facility at Victoria, BC, acquired for its frames and stringers. A sad end indeed to the prototype Vazar Turbo Otter.